Senate Majority Leader Becca Balint (D-Windham) recently penned an op-ed discussing “The Financial Predicament of Millennials.” She opens by quoting a young friend who is struggling to make student loan payments, find affordable child care, and pay the mortgage. Balint concludes noting, “Vermont’s young families face much bigger financial obstacles than their predecessors. They aren’t whining; they’re telling the truth, and we need to listen.” This is true. But the “much bigger obstacles” are the direct result of policies put in place by Balint and others who share her big-government-control ideology. Take the first example of struggle: student loans. Who dominates the university system today? Progressives. In 1964, the average annual cost, including tuition, fees, and room and board, for a four-year public university was $1,051, and $2,202 for a private university. Those are calculated in (nearly, 2007) current dollars. It was common for students to earn their tuition for the year with a summer job as a waiter or life guard. Today you’d have to have a summer job as a hedge fund manager to pay for your college. Those same averages had by 2007 ballooned to $14,203 and $38,400 respectively (Source: National Center for Educational Statistics) and are certainly much higher today. For example, UVM’s 2017-18 rate for in-state students was $29,792 and $53,408 for out-of-state. … is the major law that governs federal student aid, was intended “to strengthen the educational resources of our colleges and universities and to provide financial assistance for students in postsecondary and higher education.” It increased federal money given to universities, created scholarships, gave low-interest loans to students, and established a National Teacher Corps. The original law… has been reauthorized nine times through the years. Sounds great, doesn’t it? The government (we’re here to help!) stepped in and messed with the free market to ostensibly make higher education more affordable and accessible. In practice, however, these left-wing politicians in collaboration with left-wing academics have since turned higher education from an affordable path to prosperity into an unaffordable debt-ridden path to poverty for too many young people. Which brings us to the second mentioned area of struggle, affordable child care. Here in Vermont we are witnessing in real time our ideologically left-leaning government create a childcare crisis both in terms of accessibility and cost. 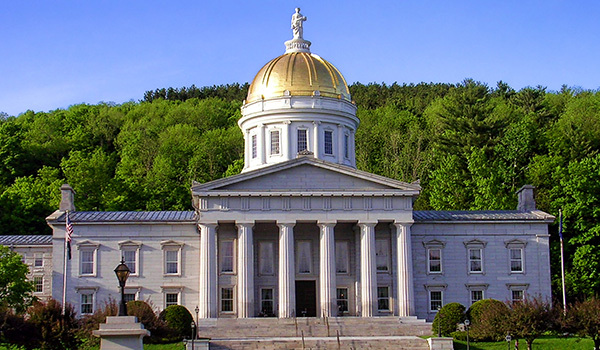 In 2016, Montpelier passed a number of draconian regulations that were designed to drive private childcare providers out of business. It worked! According to the Vermont Joint Fiscal Office, since 2015 the total number of childcare slots in the state has dropped by 1,693 or over 7%. But, as the report states, “the most striking result of this analysis of child care capacity is the significant reduction in home providers and child care slots,” where capacity declined by over 25%. So, thanks to the Progressive policies of our government, young families now have fewer childcare options, and those that are still available are more expensive because they have to incorporate and pass on the additional cost of complying with the 2016 regulations. The nefarious objective here is to create a false crisis of access and affordability that will generate a public outcry so that the government can then provide the taxpayer-funded, government-run “solution” of birth to five public schooling. This, by the way, its advocates estimate will have a price tag of about $850,000,000 annually. Add that to our current $1.7 billion K-12 education spending and see what it does to your property tax bill! Which gets us to the last point of contention: paying the mortgage. Unbearably high housing costs are, indeed, a plague afflicting young people trying to settle in Vermont. But every initiative the majority in Montpelier has recently pursued and is pursuing will increase – not decrease — the cost of housing in Vermont. High property taxes are one big cost to owners or passed on to renters, but no serious reform efforts are being considered in regard to lowering them. Our regulatory and permitting processes is expensive and unpredictable – high costs, again, passed along to the owner/renter if the hurdles don’t discourage adding housing capacity in the first place — but no efforts are underway to streamline them. In fact, the Act 250 “reform” being proposed today would make it harder and more expensive to build housing by, for one example, requiring new structures to be “carbon neutral.” That may sound nice, but it will make paying the mortgage a more daunting task. Add to the complaints Balint lists a Carbon Tax, making transportation more expensive as well as heating that already unaffordable home. And, a $15 minimum wage that will make entry level jobs more scarce. And a new payroll tax that will cost the medium household income nearly $700 a year for a Family Leave benefit most Vermonters don’t want and will never use. And “progressive” health insurance mandates and regulations that artificially drive up costs for young people…. Boo hoo how about the rest of us!!?? So well said Rob, I have watched first hand how child care costs has sky rocketed, housing costs and college cost have become unbearable. My daughter and husband and 3 children have moved in with use 2 years ago due to one losing their job. They are both working now but child care costs are crippling. For a 3 yr old 1/2 day and a 5 yr old for 1 hour a day it is about $400-450 a week. And once you are locked in it does not matter if I keep them with me during the day on my days off it costs the same. We did have someone doing a ‘Home day care” but the state makes so many regulations it became impossible. 25-30 years ago we had several people in the area that watched kids with their kids after school or during the day. They did not have the ridicules rules and over regulations we have today. You spoke with friends who would recommend someone and my kids grew up fine, graduated from high school and college all without pre-school. I hope Vermonters wake up and soon. How can these people be convinced of the truth about what is happening? I don’t understand how these legislators can be so blind and oblivious. Your article makes it pretty clear. How can they not get it? What’s your thoughts on this? Why does the Leftist agenda continue to plough forward in light of salient arugements like you make here? I cannot wrap my mind around the fact that these legislators are incapable of seeing that 2+2=4. Have you ever sat down and had a discussion with M.Johnson or T.Ashe? I’m so curious to understand how they can believe their agenda actually helps Vermont. Kyle, I think it’s a combination of self-centered arrogance, a desire to control other people, and the replacement of religion with political ideology. The reason you are not able to move a reasonable agenda forward is because you cannot resist demonizing those who disagree. There are so many salient points made here about specifics regarding policies and their impact on Vermonters. If you guys could stick to salient points and leave out things like “leftist agenda.” You’d actually start moving people in your direction. You have to soul search. Do you care more about actually making steps in the right direction, or is it about spleen venting? I am a very independent thinker and 8th generation Vermonter who is neither afraid of Republicans nor Progressives. I agree with most of the GOP fiscal agenda, but I can’t stand the froth and bother over stupid labels, fetuses, and guns. Thanks for your remarks, Jodi. But I don’t think accurately referring to politicians and policies as Progressive or Leftist is demonizing. They are, and people need to understand that these policies are born of a particular political ideology. As a free market advocate I’ve been called some pretty demonizing things myself that go far beyond my being labeled “conservative” or “right-wing.” I refrain from engaging in the kind actual demonization and name calling of those with whom I disagree. I seriously doubt Progressive/Leftist politicians and activists would abandon their policy objectives because their political ideology were not pointed out. Thanks for engaging in civil debate. Rob….. excellent article that ties our “progressive” legislature tightly to the problem of the millenials (and many others) exiting from the state. I can only see a problem with the very first numbers for 1964 college costs. I remember having to pay about $1000 initially at University of Maine as an out of state student in 1965 so I would suggest that the four-year public university at $1,051, and $2,202 for a private university for annual costs are 1964 dollars, not 2007 dollars. The “[In current dollars]” on the chart at the National Center for Education Statistics refers to the date you are looking up not today’s date nor the last date on the chart. It would be up to the user of the chart to convert to which ever date is used for comparison. By using the COLA calculator at the American Institute for Economic Research’s web site the two numbers become $7,030 and $14,728 for 2007 dollars respectively and $8,513 and $17,837 for 2018 dollars, still remarkably less that the average costs in 2007 of $14,203 and $38,400 respectively. Also the 2007 numbers you show are for “in state public” and “private university”, and the UVM 2017-18 rate for in-state students was $29,792 and $53,408 for out-of-state. By applying the COLA calculator to the average costs both public and private from the chart for 2007, $14,203 and $38,400, they become $17,201 and $46,506 respectively for 2018 dollars which again begs the question, why are UVM costs so much higher than both the average “in state public” and the average “private university”. It seems we have again a “progressive” bunch of trustees that convert the money from the “haves” into grants for the “have-nots” without any question of fairness to the “haves” which are largely middle class who work and are not familiar with handouts. In any case your point of increased costs getting out of control is still very well made. Thanks for the thoughtful and detailed comments, Edward. But at the top of the linked chart it says, “Average undergraduate tuition and fees and room and board rates charged for full-time students in degree-granting institutions, by type and control of institution: 1964-65 through 2006-07 [In current dollars].” So, I have to take them at their word that these calculations are in current (2007) dollars when the National Center for Educational Statistics put this together. Still, you make some very good points. Thanks! Rob I only remember what I paid to University of Maine in 1965 so using that as a basis the logic follows. I admire your work and wish that you would run for Governor.